Guerneville bed and breakfast travel guide for romantic, historic and adventure b&b's. 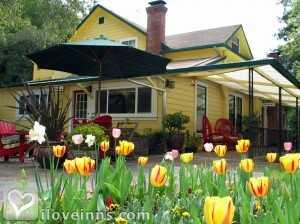 Browse through the iLoveInns.com database of Guerneville, California bed and breakfasts and country inns to find detailed listings that include room rates, special deals and area activities. You can click on the 'check rates and availability' button to contact the innkeeper. Guerneville is located in North West Sonoma County, the Russian River Valley.Armstrong Woods, a state preserve of old growth redwood forest is three miles away. Guerneville is strategically located if you are visiting wineries in the Russian River, Sonoma Coast and Alexander Valley. Guerneville is 12 miles away from the estuary of the Russian River in the Pacific Ocean. By Applewood Inn, Restaurant and Spa. Guerneville is home to Armstrong Redwoods State Redwoods Reserve, the Jazz and Blues Festivals, The Russian River, Wine, Beaches and even more. By Sonoma Orchid Inn.